The world’s largest repository of Russian art is due to open branch in Malaga, Spain March 25 after a decade-long deal was signed. 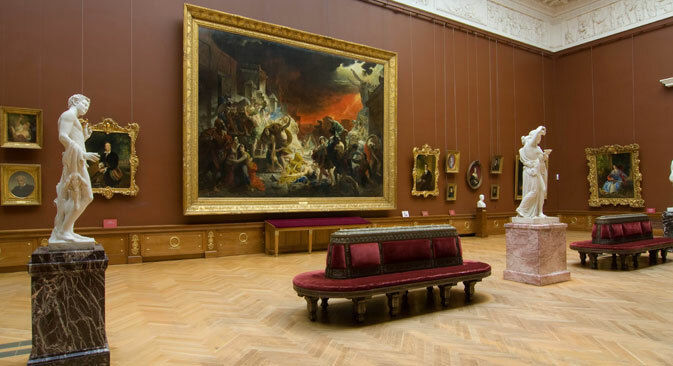 The Russian Museum was founded in St. Petersburg in 1895 and is the world’s largest repository of Russian art. In May last year, its administration reached an agreement with Malaga's mayor to set up its first European branch. St. Petersburg will supply Malaga, situated on Spain's southern Costa Del Sol, with some 100 exhibits for the main exhibition, which will be refreshed once a year, and with 50-60 other Russian pieces of art for two minor exhibitions. The Spanish side has provided a building to house the collection and will cover all the costs of maintaining the museum and holding exhibitions. In 2015, the city administration will allocate more than £3 million for the project. The director of the Spanish branch, José María Luna, said that sponsors would also support the museum. The 10-year agreement can be extended when its term expires, he added. Both sides have agreed to turn the branch into a Russian cultural centre in Malaga. The new branch museum is housed in a former tobacco factory La Tabacalera, which over the past 12 months has been fully adapted to meet its needs. La Tabacalera has an area of 7,500 square meters, of which 2,300 square meters will be allocated for exhibitions. The museum is launching two opening exhibitions: Russian Art from Icons to the 20th Century, representing five centuries in the development of Russian art (from the 15th to the 20th century) and The Diaghilev Era, devoted to the life and career of the famous Russian patron of the arts and founder of arts magazine Mir Iskusstva, Sergei Diaghilev. In the second half of the year, an exhibition devoted to Pavel Filonov and Russian avant-garde art, will replace Diaghilev. The Costa del Sol is home to one of Spain's largest Russian communities, which has been a key factor in opening the branch. Russian businesspeople came up with the idea and lobbied the St. Petersburg museum's administration to take up the idea. They also helped in talks with the Spanish side and are involved in sponsoring the project. The Russian Museum currently has over 150 so-called “virtual branches” in Russia, Finland, Estonia, Ukraine, Kazakhstan, and Azerbaijan. These are educational events, seminars, lectures, and exhibitions that are conducted at universities, museums and other culture and education facilities. An attempt to open the museum’s first international branch was made some years ago in Japan, but was abandoned after it ran into financial problems from the Japanese side. The collection housed in La Tabacalera in Spain is so far its only physical branch abroad. But another Latin location is on the cards: Gusev is in talks to open a South American branch in Havana.